After four years, I am suffering muscle pain again due to my cardio routine. Last October 2008, I experienced shin splints that prohibited me to run for almost a month. As alternative, I used other cardio equipments that will not involve the shin; I even blogged about it to warn others not to overuse the muscles. You can view the blog post about my shin splints here. But now, the pain came back and this time, it involves the plantar fascia of my left foot. 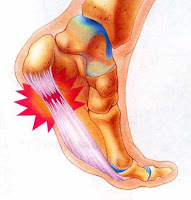 According to Wikipedia, plantar fasciitis (PF) is a painful inflammatory process of the plantar fascia, the connective tissue on the sole (bottom surface) of the foot. It is often caused by overuse of the plantar fascia or arch tendon of the foot. It is a very common condition and can be difficult to treat if not looked after properly. Another common term for the affliction is "policeman's heel". I think the cause of the pain was my last week's cardio exercises. I increased the speed and I was wrong not to do it gradually. I 'leveled up' my cardio workout as a preparation for my marathon next year. I registered in Standard Chartered Marathon here in Dubai to be held on January 25, 2013. I have four more months to train but due to this pain, I might need to slow down. The most important thing now is to rectify the situation and ensure that this will heal immediately. Still according to Wikipedia, treatment options for plantar fasciitis include rest, massage therapy, stretching, weight loss, night splints, motion control running shoes, physical therapy, cold therapy, heat therapy, orthotics, anti-inflammatory medications, injection of corticosteroids and surgery in refractory cases. Also, in some cases, massaging of the inflamed location serves as a temporary relief.